Included in Cordier Auctions’ large mixed-discipline sale to be held in Harrisburg, Pennsylvania, on February 9 will be a group of four clocks that once came from the Chicago dealer Lee Benkendorf. This French musical mantel clock by Henri Robert is estimated at $800-1200 at Cordier Auctions’ February 9 sale. They will include this French musical mantel clock by Henri Robert set on a base fitted with a musical movement playing two tunes and covered with a brass dome. 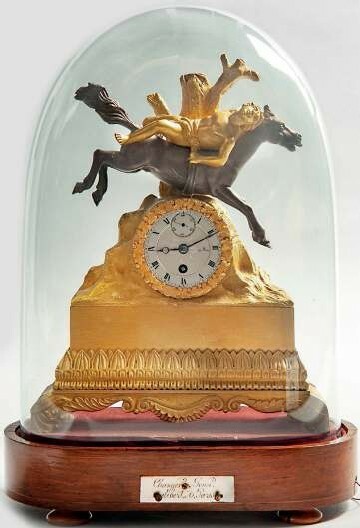 The 15in (38cm) high clock features a gilt-bronze figure of Mazeppa tied to a horse – a reference to a legend made famous by Byron’s poem of 1819. Both the dial and the eight-day movement are signed Robert a Paris and the clock is guided at $800-1200.